This is a follow up of a post of mine already dated two years ago http://www.coderanch.com/t/630743/ocajp/certification/exam-personal-feedback-random-thoughts . After having take a break from Java study (I pursued a certification as a professional penetration tester as information security is the other topic which passionate me), I turned on last November to Oracle certification, specifically to 1Z0-804 as a natural evolution of the previous achieved Oracle Certified Associate. It took me a good amount of time, let's say from November to June (even if I originally planned to take the exam on April, I had unexpected health issues which made me postpone the test). I'm a full day worker and my job does not involve Java programming, so I had to study during the evening and weekends balancing that time with my family (wife and daughter) needs. As almost every one will tell you the exact amount of time needed to prepare for the exam depends on many different factors, like the actual amount of time you can dedicate to studying, your actual knowledge level in advanced Java topics. From this perspective, even if I'm not the proper one to make such a statement, I'd underline that even if you are an experienced Java programmer, that's alone could not be sufficient to pass the exam. I had this confirmation many times when I submitted some tricky question I came along during my preparation to some of the colleagues of mine who actually work as developers and I can tell you many of them failed in answering those questions. To answer them correctly you have to set your mind in compiler mode. That's an important point to note. At least in my humble opinion. I've found the 1Z0-804 study much much harder than the 1Z0-803. Some of the topics included in the exam objectives were really hard to understand (I'm thinking especially about Generics, and Concurrency). The number of topics and exam objectives are also greater than the ones included in the first level. I've studied using many different sources of information. 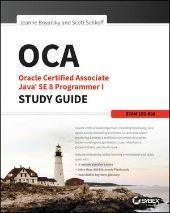 The main one was Mala Gupta Oracle Certified Programmer Java SE 7 Programmer II Certification Guide Prepare for the 1ZO-804 exam https://www.manning.com/books/ocp-java-se-7-programmer-ii-certification-guide. I decided to go with that book mainly because I used the same author for the previous certification and I liked her style. Overall the book itself is good and gives you the right preparation for the exam. I would like to thanks the author Mala Gupta for her kindness in answering my questions when I had some doubts. One bad thing about the book was it came with only one full mock exam test (available as free download from Manning website), whilst the book on Oracle Certified Associate certification had if I'm not wrong two full mock tests. Furthermore the mock test was made of 90 questions but the actual exam has 65 questions (not a major issue, but if you want to simulate exactly the exam state like questions number, exam objectives distribution - that's not easy). As a study technique I filled 3 Moleskine workbooks with notes and flash cards. Those were my most used resource during the final steps of the preparation. Another book I bought was the K&B Oracle Certified Aassociate/Oracle Certified Programmer Java SE 7 Programmer I & II Study Guide (Exams 1Z0-803 & 1Z0-804). Things I liked a lot about this book were: hardcover! So nice (and so rare nowadays). Writing style from the authors: brilliant. Funny statements here and there which allow you to take a break from the hard content. Extra content about Java Developer certification was also really appreciated. Things I did not like: the software bundled within the compact disc which allowed you to run mock exam tests. Interface was terrible. This should be your main reference point. Browse, read and memorize all the main classes, descriptions and methods covered by the exam objectives. Really helpful, easy to follow. Should be read by everyone pursuing the certification. Essential reading when it comes to clear any doubt you might have reading other sources of information. Here lies the only truth. As Generics were one of the hardest topics I also read the great freely available above content. Enthuware http://enthuware.com/index.php/mock-exams/oracle-certified-professional/ocpjp-7-questions: it's simply the best option out there in my opinion. Nothing can be compared in terms of software configuration options, content quality (number of questions, questions difficulty level), price, support, answers explanations to the Enthuware package. I will recommend it again and again. I found the package useful in supporting my exam preparation. It lacks many of the Enthuware options, but it has for example a nice flash cards feature which allows you to focus on some important topics. The questions were easier than the ones from Enthuware, but they allowed me to increase my confidence level. It's a lot more expensive than the Enthuware. This one deserves a special comment. This is by far the the place where you'll find the trickiest and hardest questions about OCP. At least that was my experience. I would like to thank Frederick Tyler and Devaka Cooray for their support and for the great content they make available to certification aspirants. The price is really affordable and it gives in some purchase options also the possibility to access some video content and pdf files. One thing I notes about examlab content is that it's still mainly based on 1.6 certification, so that could arise some thoughts in people pursuing 1.7 or 1.8 certification. I just took a couple of test exams from examlab, then as I saw the result I got I preferred to switch to some a little bit easier. I can say that if you score well on their tests you're quite sure to get near to 100% in the actual exam! I found it easier than many of the practice tests I took during the final weeks of my preparation. Nevertheless I passed by just few percent points. I achieved for the 1Z0-803! That's interesting! The amount of time (150 minutes) is more than enough. I actually finished all the questions in 90 minutes and I took the remaining 60 minutes to review each one of the 65 questions. I know this topic has already been discussed here and that many valuable opinions have been thrown in, but I would like to remark this as it's really really something of utter importance. very difficult to spot even for an experienced eye, imagine for a non experienced one the dramatic effects that this could lead to...). different people, skills and so on. But I stick to the facts/numbers: it's not admissible that a certification book contains so many errors. If that's the fact (and it is) it means the review process is not effective and must be thought again. Errata and addendum are well appreciated but they do not solve nor fix the issue for many reasons everyone of us can easily understand. I would like to ask if someone can help me understand why I don't see the claim share badge option under my Oracle certview page, as it's there for the OCA certification. I would also like to ask you what is the process to follow in order to request a printed copy of the certificate (as I successfully did for the Level I). It seems I'm not able to find the request page or procedure. As already posted in the forums, there is a 35% off for some exams. I had the chance to use the discount code for my exam, so my thanks goes to Oracle for this initiative. In CertView you will see in 1..2 days a Personal Message which will tell you that you can request paper certificate. Just wait a bit.. I agree with you about errata in study guides. The topic about study guides and their errors/errata should deserve its own sticky discussion. It would be nice to read renowned authors (Jeanne, Mala Gupta, Sierra, Bates, etc), who are also active members/staff here at coderanch, opinions about this. • To request a printed certificate, you are required to log onto your CertView Profile and confirm your personal or office mailing address. //here XXXXXXX is my Oracle Certification ID. • You will be prompted to confirm the address. I did that and I got the confirmation email. 2) As per the screenshots posted in my previous post, I'm not able to find the claim/share badge for the newly cert. they have forwarded the case to the concerned team regarding your missing badge issue for Oracle Certified Professional, Java SE 7 Programmer certificate, and they will revert you with an update in 2-3 weeks. Marco Canavese wrote: The topic about study guides and their errors/errata should deserve its own sticky discussion. It's really hard to write a cert book without errors. I assure you we tried. I do believe in public disclosure of all errors. See why. Bert does as well and his review process is even more thorough than ours. This doesn't excuse it I'd rather the errors be documented than unknown ones. And I'd rather use a book that the readers cared enough to report the errors rather than unknown ones. thanks for answering and pointing us to the useful post about why errata matters. I'd like to clarify one point which might have not been clear because of my poor english skills. I was not criticizing the usefulness of the errata themselves which I completely agree with you are of uttermost importance for the exact same reasons you stated in your post. I was just throwing in my opinion that a cert book/study guide should not reach out the customers if there are so many errors/typos in it. And you know for your same acknowledgement there are many of them (please note once again these are general considerations not at all directed to your book which I have not used for my study as I was going for SE 7 certification). My point was directed to enforce if possible the review process so that once the book is published those errors will be effectively reduced. How to do that is something I have difficulties to even suggest as I cannot even imagine how difficult is to write a techincal book. You were clear. I took it in the spirit it was intended. It's tricky because you don't see how many errors are removed. I saw this first hand for my books and past books by Mala and Kathy/Bert. Hard copy of the certificate just arrived. Hi, Congratulations on your achievement. Have you applied for the Java T Shirt? Is there any kind of tracking mechanism for that? I qualified 1Z0-804 on June 11, 2016 and have requested my T Shirt, but I dont remember getting any tracking ID or any such thing for that sort. Prawal Srivastava wrote: Hi, Congratulations on your achievement. Have you applied for the Java T Shirt? Is there any kind of tracking mechanism for that? I qualified 1Z0-804 on June 11, 2016 and have requested my T Shirt, but I dont remember getting any tracking ID or any such thing for that sort. There is no tracking for it as far as I know. You can refer to this page Oracle java t-shirt for some information. At least there is an email address we could use to contact them. Let me know whether you get it or not. With a big surprise because I had no more hopes to receive it, yesterday I got the special gift. Did you receive a card with your name,also? From terere's land everything is cool-oh.